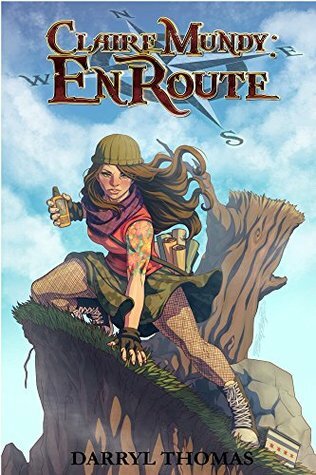 Claire Mundy, a 24 year old college student and adventurer, suddenly receives information that could lead to her missing mother. While she hunts down the clues, she must race against a secret society, who are after the same clues, and are searching for her mother as well. With the help of her friends, she will embark on the adventure of a lifetime! This book contains the first arc of the adventure, plus two additional tales in the life of Claire Mundy. We all know the saying about judging a book by its cover, but it's the cover that drew me in to this book. Who doesn't want to read about a girl who is clearly pretty awesome? Not this girl. Claire is a strong, independent woman who tackles everything she meets head on and I love that about her. The author keeps each story moving and throws in pop culture references from perhaps his childhood which made the read a lot of fun for me. The stories in the book don't really feel as if they tie together. I expected that the stories following the introduction to Claire's mom being missing to have some aspect of that. Instead, they were stand alones which while fun left me feeling a bit disjointed. If you're looking for a great book for your middle-reader, I can absolutely recommend Claire Mundy. It's fun, full of adventure, and personally, I can't wait to find out what happens next with her, her mother, and the secret society!